Whether your child is into spying, adventure and espionage stories, enjoys crafting or is interested in science, making a periscope and kaleidoscope will definitely be a home project that they’ll be interested in! Before you begin, you should note that because this project uses sharp cutting knives, an adult should closely supervise all children taking part. 1. Firstly, if you’ve opted to use a cardboard, you’ll need to tape the box ends down firmly. Once this has been done, you can also cover the rest of the box in tape to make it much more sturdy. However, a juice carton should be strong enough. 2. The next step is to cut out the windows for the mirrors. To do this, you’ll need to place a mirror about 1cm from the top of the box, and trace around it with a pen. You can then cut the window hole with the cutting knife. Try to cut the hole slightly smaller than the mirror. Repeat this step on the opposite side of your box, but at the other end. 3. To insert the mirrors, you can either cut in a ‘door’ by slicing down one upright side and the top and bottom of that side, and then sticking the mirrors at a 45-degree angle. Alternatively, if the mirrors are wide enough, you can make a diagonal 45-degree cut into each of the box by your windows, and slide the mirrors through. You’ll need to put some extra tape or sticky-tack along the sharp edges. Also remember that the two mirrors should be opposite, so that one mirror reflects into the other. This periscope should then be ready to use! You can try it out looking over windowsills or around corners for best results. Making a periscope is a great way to combine art and science in a fun craft project for kids. Here’s some easy to follow instructions. 1.Take the plastic sheet and draw out a rectangle measuring 11cm x 20cm. Cut out the rectangle with your cutting knife, making sure to be careful of any sharp edges. Once cut out, you can then divide the rectangle into 4 sections – 3 sections of which should be equal, and a ‘lip’ of around 1cm. 2.Using the ruler to help you keep a straight line, bend the plastic sheet inwards to make a triangle shape with a lip. Fix the lip firmly shut on the outside of the triangle with some clear sticky tape. 3.At this point, you will then need to create a circle to put on the end of the kitchen roll. Place the tube end down on your sheet of waxed paper and trace a circle around it. Do this twice and cut out two circles, leaving a small gap around the circumference. Before fixing to one of the circles to one end of the kitchen roll with clear sticky tape, make a hole in the centre of one of the wax paper discs. Leave the other circle for later. 4.Push the triangle inside the kitchen roll tube through the remaining open end. 5.On the open end of the kitchen roll tube, take a small amount of cling film and lay over. Give a little bit of slack to create a very small pouched area. Secure the cling film with a rubber band, and put the tube on its end, with the cling film end facing upwards. 6.You can then fill the pouch with a few of your ‘shiny’ objects, e.g. seed beads and sequins. Take your remaining wax circle discs and place it over the top of the cling film. Secure in place with another rubber band and trim any excess of cling film. 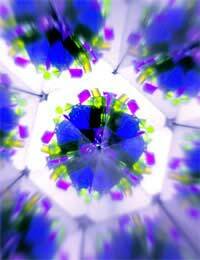 7.You can then take your kaleidoscope to a well-lit area and look through it. As you turn the tube, the light reflected through the shiny materials inside the end pouch should repeatedly bounce off the sides of the triangles, creating beautiful patterns that change as you move. 8.If you want to go that extra mile, you can decorate the outside of your kaleidoscope with wrapping paper or stickers. This is the perfect idea anyone ever gave me for my school WEALTH FROM WASTE ACTIVITY. it is DUCT tape not duck tape and was developed for joining lengths of air-conditioning ducts, hence the name!